A couple months ago, JetBlue announced that it was partnering with East Harlem pizzeria Patsy’s to fly real New York-style pizza 2,800 miles from JFK to LAX. It was a stunt to promote the airline’s NYC to L.A. route, but the underlying sentiment was that you still can’t get a really good slice out here on the West Coast. We object. What follows is a list of very good New York-style pizzerias, arranged from west to east, so now you’ll know where to look when the craving strikes. They may not replace Patsy’s or Prince Street or Di Fara in your heart, but their pies have to be better than anything that spent eight hours in transit, and they offer good evidence that the secret isn’t the tap water. Manhattan Pizzeria is a little pizza joint about a block from the sand, but if it weren’t for the brosephs in board shorts at the next table or the sound of crashing waves coming through the front door, you could almost be convinced you were in midtown Manhattan and not Manhattan Beach. The shop is long and narrow, and the slices that owner Bobby Eskowitz—a Brooklyn native and Spago veteran—slings are pretty much perfect, up there with any slice you’ll find on the beach or in the city. 133 Manhattan Beach Blvd., Manhattan Beach. Vito’s has long been among the easiest spots to recommend for East Coast-style pizza. The homey original on La Cienega has been churning out consistently excellent slices and pies since the moment its doors opened. The newer Santa Monica outpost may not have the first location’s magic touch quite yet, but it does have plenty of big TVs and pretty good beer and cocktails, which make up for any inconsistencies in the food department. 846 N. La Cienaga Blvd., West Hollywood. You can hardly throw a rock on Fairfax without hitting one of owners James Starr and Jason Bernstein’s restaurants, be it the Golden State, Cofax, or Prime Pizza. At Prime (both on Fairfax and in the newer Little Tokyo location) as at their other shops, the ingredients are carefully sourced and skillfully handled, so the 24-hour fermented dough turns into a thin crust with the right balance of crunch and chew, the sauce is sharp and sweet, and the toppings are scattered just so. Also stop throwing rocks on Fairfax. 446 N. Fairfax Ave., Fairfax. 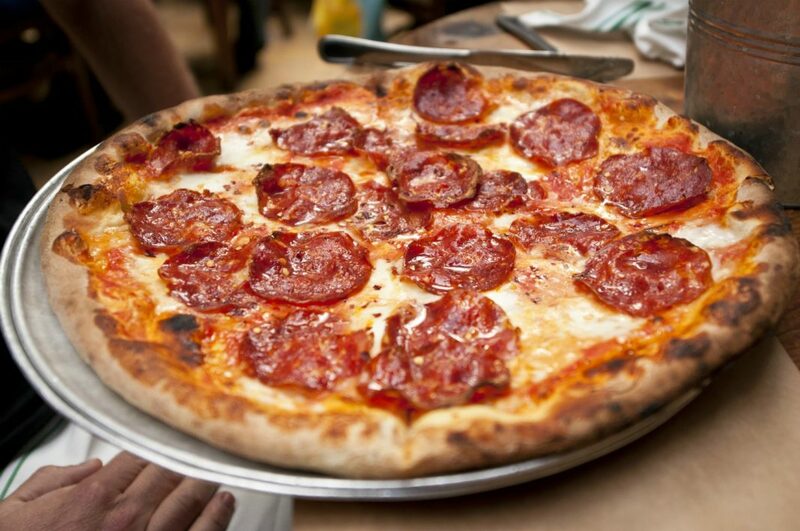 The recent wave of transplanted New York restaurants in town is well documented, but before the cronut or the black truffle chicken, there was Brooklyn native Steve Cohen’s Village Pizzeria, which opened in Larchmont Village in 1997. More than 20 years later Village Pizzeria is a Larchmont institution, with New York paraphernalia on the walls and excellent New York pizza in the oven. They make their own sausage and sauces, and the pepperoni curl up at the edges, collecting grease and getting just a bit of char in the most beautiful way. 131 N. Larchmont Blvd., Larchmont Village. Let’s get this out of the way—Superfine Pizza, the brand-new pizza window from Steve Samson of Sotto and Rossoblu, is not a strictly New York-style spot. He calls their pizza a hybrid of New York and Neapolitan styles, thinner at the tip and a little droopy, but crispy on the bottom so that it holds a perfect sharp fold. There are clear L.A. influences here too, like a slice with escarole and a vegan option that’s loaded with veggies and sluiced with olive oil. But whatever style you want to call it, these slices are better than fine. 1101 San Pedro St., downtown. Pizzanista! is part of a long tradition of joints by and for pizza-loving skater punks, one that stretches back even before the Teenage Mutant Ninja Turtles. The shop is dark and loud, and chaos spills in from busy Seventh Street and Tony’s Saloon next door through the large open window. It’s a hectic, fun scene, and the pizza fits that ethos: NY-style pumped up with all sorts of whimsical specials, from Mac ‘n’ Cheese to the Meat Jesus. They also prominently feature plenty of vegan and gluten-free options, including a shaker of nutritional yeast right next to the Parmesan. 2019 E. 7th St., downtown. Pasadena may be the polar opposite of Manhattan in many ways—it’s spacious, clean, quiet, and early to close—but the Pie Life Pizza takeout window mimics the New York pizza experience pretty well. You order a slice, they throw it in the oven, shout your name when it’s ready a minute later, and then you sit outside on one of the scattered tables or on some stairs and wolf down your excellent slice at top speed like you have a train to catch. The slices have thin crispy crust, bright house-made sauce, and an ample but not overwhelming layer of cheese. 691 S. Raymond Ave., Pasadena. RELATED: The Ultimate Pizza Crawl Through Northeast L.A.